Computational modeling largely based on advances in artificial intelligence and machine learning has helped furthering the understanding of some of the principles and mechanisms of multisensory object perception. Furthermore, this theoretical work has led to the development of new experimental paradigms and to important new questions. The last 20 years have seen an increasing emphasis on models that explicitly compute with uncertainties, a crucial aspect of the relation between sensory signals and states of the world. Bayesian models allow for the formulation of such relationships and also of explicit optimality criteria against which human performance can be compared. They therefore allow answering the question, how close human performance comes to a specific formulation of best performance. Maybe even more importantly, Bayesian methods allow comparing quantitatively different models by how well they account for observed data. The success of such techniques in explaining perceptual phenomena has also led to a large number of new open questions, especially about how the brain is able to perform computations that are consistent with these functional models and also about the origin of the algorithms in the brain. We briefly review some key empirical evidence of crossmodal perception and proceed to give an overview of the computational principles evident form this work. The presentation of current modeling approaches to multisensory perception considers Bayesian models, models at an intermediate level, and neural models implementing multimodal computations. 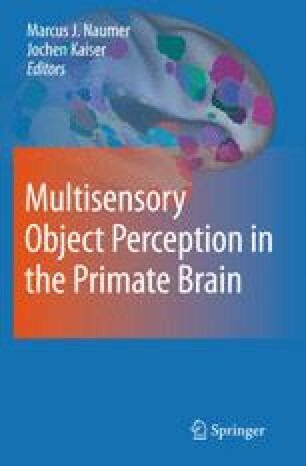 Finally, this chapter specifically emphasizes current open questions in theoretical models of multisensory object perception.